In the last two posts (part 1, part 2) about Reply, I mentioned that there was some questionable provisioning for overdue receivables and that free cash flow generation in general looks relatively weak. So let’s look at a further example, if and how reliable Reply’s accounting is. In February 2009 Reply Group, through the subsidiary company Santer Reply S.p.A., finalized the acquisition of the Motorola research centre based in Turin. The acquisition, accountable as a “net asset acquisition” was purchased by Reply for a symbolic amount of 1 Euro and comprised 339 employees, 20.6 million Euros in cash, 2.9 million Euros of assets and liabilities for 23.5 million Euros. Reply has committed to the operation on the basis of the research perspectives outlined at the time of acquisition and the agreements defined with the public administrations (Region and Ministry of Development). Such agreements foresee that the Piedmont Region finance through a free grant a maximum of 10 million Euros on the condition that the Research centre carries out projects within the research and development of Machine to Machine (“M2M”) and that proof can be provided. Furthermore, the Ministero dello Sviluppo Economico (S.M.E.) has made a commitment to grant the Research centre a loan for a maximum of 15 million Euros of which 10 million a free grant for research and development projects similar to those agreed with the Piedmont Region. In the last months the Board of directors of Reply Group and Santer Reply S.p.A have outlined and defined organizational strategies of the course of business of the Centre. More specifically costs related to research projects have been quantified and the financial resources necessary for such research projects and means of disbursement have been defined by the Public Administrations. Strangely, the stated “payments for the acquisition of subsidiaries net of cash received” is negative !! We know that they only paid 1 EUR, received 20 mn and didn’t do other big acquisitions in 2009. I do not know where they actually booked the acquired 20 mn EUR liquidity, but this is very very strange. The second part of the puzzle are the Government grants out of this deal. Government grants are recognized in the financial statements when there is reasonable assurance that the company concerned will comply with the conditions for receiving such grants and that the grants themselves will be received. Government grants are recognized as income over the periods necessary to match them with the related costs which they are intended to compensate. Based on Note 29, Reply booked already such a provision of ~23 mn EUR at the end of 2009, from where they used half of it again. I am not sure why,but again, where is the corresponding asset ? I would assume somewhere in other receivables (as they may not have received the Government money in 2009). If one of the readers really understands what is going on here, then please help me. This might explain why the very unusual and unexplained line item “changes in other assets and liabilities” makes up 2/3 of Reply’s 2010 operating cashflow. In my opinion, there is poor visibility in the accounts and especially in the cash flow statements. We know now, that the Motorola transaction netted them around 40 mn EUR net cash, but didn’t show up in the investment cashflow. 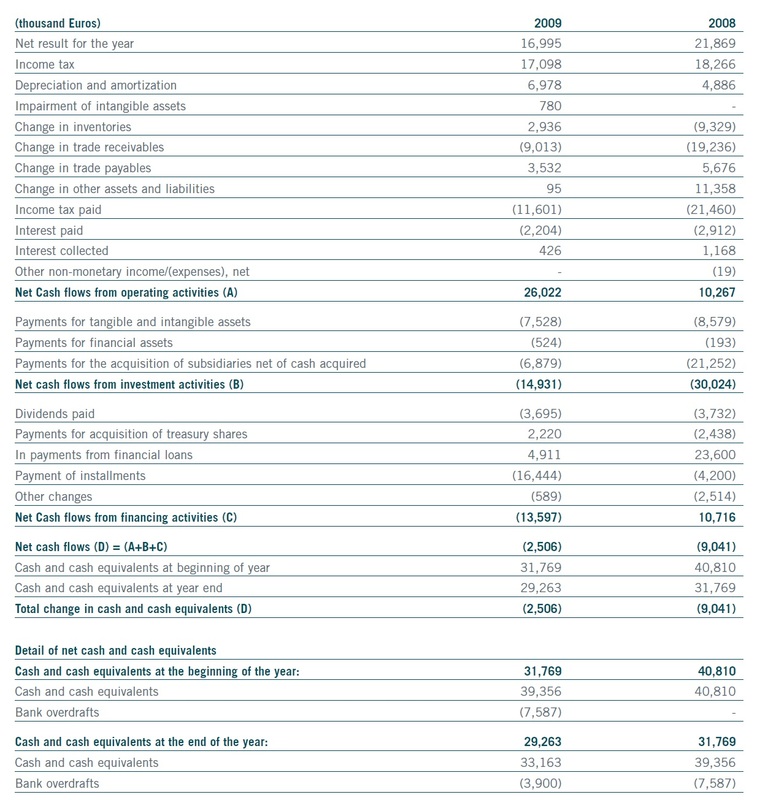 As it didn’t show up in financing cashflow neither, it has to be moved into operating cash. As operating cash in total from 2009-2011 was only 55 mn EUR, basically a large amount of the operating cashflow in this period seems to be non-operating and coming from the acquired Motorola Research center. Maybe I am just not clever enough, but my philosophy to avoid companies with large intangibles and non-transparent accounting makes me stop here and not further investigate the company. Kas Bank, my latest portfolio addition released H1 results today. Topline one sees a decrease, but the important part, commission income remained stable at 36.5 mn EUR. Underlying administrated Assets increased nicely. In H1 2012, investment funds’ demand for KAS BANK’s independent custody services increased further in connection with the coming AIFM Directive which will take effect in mid-2013. This European Directive will impose tougher requirements for the custodial function of investment institutions. This looks like a structural “tail wind” for custodians. All in all, the 0.56 EUR earnings for the first 6 months looks like a solid profit at this point of the cycle. As the result does not yet include the sale of the Clearnet stakes, I think full year results should come in at least at 1 EUR per share. So far, KAS Bank seems to do relatively well in this low part of the cycle. I will therefore continue to build up a full position (5%) of the portfolio. Trading volume in KAS Bank was low the last few days but picked up today. First of all thank you for the many helpful comments in part 1 of the Reply post. One could say despite good profitability, all of those companies are relatively cheap. Apart from tiny Prodware, Reply is the second cheapest despite above average ROEs. It is obvious, that Reply and Indra (from Spain) do have issues with receivables. Reply Germany only has ~64 days of receivables outstanding. Based on profit per employee Reply looks good as well on par with German Bechtle and French prodware. Operating margins are far above average. So what not to like ? As we can see, the business is usually quite cash generative, only Reply has negative free cashflow. How comes ? So over the last 5 years, 50% of the free cashflow had to be invested back into working capital, 25% into acqisitions, the rest into Capex, dividends and financing. If we look at 2010, we can see that this was a very strange year with a big jump in cashflow whereas 2011 looks rather bad, especially compared to net income. One of the major factors in 2011 for the low cashflow seems to be an abnormally high tax payment (30 mn va. 13 mn the year before). I have to admit that taxes are my weakest point in my analytic skill set and I don’t really understand this. The 2010 payment seems to have been lower than the tax expense, the 2011 higher, on average they seem to be similar to expenses. “Overdue” receivables jumped up from ~10% of receivables to almost 20% of receivcables. We can also see that in 2010, almost 100% of the 360 day overdue receivables were written of, wheres only 25% were written of in 2011. So this would mean 3.6 mn pre tax charges. One could even argue that based on the recent developements even higher charges would be necessary so for instance a full write off of 360+ receivabels. So we migth want to adjust Reply’s earnings maybe for ~5 mn EUR pre tax or 2.75 mn (~30 cents per share) after tax, which would still give us EPS of ~ 2.60 or a P/E of 6.6. Free cashflow generation at Reply is somehow limited as 50% of FCF go directly into an increase in working capital. Additionally, receivables accounting seems to be optimistic. So we have already 2 reasons why the stock is so cheap. However I will have to dig a little bit deeper to understand if there is still value there. In general, I do have problems when I discover “optimistic” accounting as I loose confidence in their overall accounts. For a company like Reply with a lot of goodwill and intangibles, the accounting should be more on the conservative side. Cheap Italian companies are ” a dime for a dozen” at the moment. Cheap Italian companies with rising sales, improving margins and solid balance sheets are however as common as the common “black swan”. One Italian company which looks good under my Boss Score model is Reply SPA from Italy. Reply S.p.A. specializes in the design and implementation of solutions based on new communication channels and digital media. The Company’s services include consultancy, system integration, application management, and business process outsourcing. Reply S.p.A. provides services to business groups within Telco & Media, Industry & Services, and Banking & Insurance sectors. If I understand correctly, they seem to be a kind of IT systems integration company. In their annual report, they use all the “buzzwords”, like cloud computing, mobile payments, big date business security etc. Similar to German IT company Bechtle, Reply seems to have grown through acquisitions in the past and is more a “collection” of smaller IT companies than one monolithic company. Reply has relatively low debt (they had zero debt in 2010) which is good. However we can see a significant amount of Goodwill. This is a problem if profitability would go down. So far it looks OK. With ROE of 16.5% and ROIC in the double digits (including Goodwill, 13.7%) it looks like they did not overpay for acquisitions. German IT company Bechtle AG, which seems to have a similar business model however has only 10-15% receivables compared to sales. So this is definitely something to explore further. Typically for Italian companies, the majority yof the company is is controlled by a family, in this case by Mario Rizzante through his Alika Srl holding. Hi daughter Tatian is CEO of the company. Among the other shareholders, I found the “Franfurter Aktionfonds für Stiftungen” very interesting. I am not sure how succesful they are but in their portfolio are many stocks I find interesting as well. For them, the 4.83% stacke is one of the largest fund positions. I overlooked almost one very interesting detail about Reply: Reply owns 78.6% of German listed “Reply Germany”, the former Syskoplan AG (ISIN DE0005501456). If we deduct this from Reply’s 140 mn market cap and Reply’s profit, we can see that Reply’s business ex Syskoplan is actually valued at a P/E below 5. Reply SpA looks like a really interesting stock. However I do not have a lot of experience with investing in IT service companies, despite having started by professional carreer in one. So I will have some more work to do with Reply, especially a comparison with companies like Bechtle. The one thing to watch out is clearly the receivables issue. KAS Bank NV (NL0000362648) – Specialist banking opportunity ? This is not meant to be an investment advice. Please do your own work. The author might have bought or sold the stock already prior any discussion. Don’t trust ANYONE with stock tipps or other easy ways to make money. In general I try to stay away as far as possible from banks. However KAS Bank NV (NL0000362648) might be interesting. KAS BANK pursues a ‘pure play’ strategy, underlining the bank’s absolute neutrality and independence. A low risk profile is integral to its services and is reflected in the quality of its balance sheet and its high solvency ratio. So this is important why it is technically a “bank” effectively it is a sort of service company with a banking license. Based on traditional metrics the company looks relatively cheap although technically all the banks are cheap. As a financial stock with mark to market accounting KAS bank doesnt look that good in my “boss” model but this is to be expected for any financial stock with mtm assets and liabilities. On the plus side they paid a dividend each year however earnings were quite volatile with a big loss in 2008 caused by impairments. Impairment losses on loans, including Lehman and one Madoff-related investment, bonds and equities in the available-for-sale portfolio, goodwill and two exceptional charges reduced the net result for 2008 by €58.7 million. the impairment losses (€13.9 million) relates to loans and advances to clients who are expected to be unable to repay their loans in full and, based on objective evidence, in connection with which the securities provided as collateral have fallen sharply in value. The portfolio of available-for-sale investments is made up of shares and bonds and, with regard to both, there is objective evidence of impairment losses of €21.9 million (2007: €1.5 million) and €11.0 million (2007: nil), respectively. The difference between the cost and the current fair value has been transferred from the revaluation reserve to the income statement. The deterioration in market conditions has led the bank to make a downward adjustment in the future profit projections for the subsidiary in Germany acquired 1 July 2008, involving the recognition of an impairment loss of €5.2 million in respect of goodwill. This goodwill impairment loss is not allowable against tax. In connection with the vacating of leased premises in 2007, all the previously capitalised costs of alterations to the building, totalling €3.2 million, were written off. So all in all it was a combination of different financial crisis related write-offs which caused those impairments. We can clearly see that the business model includes at least some credit risk so its not a “Pure” service function. Going forward I guess the whole industry has learned from the “Lehman moment”. At this point it makes sense to look at how the business model of a custodian looks like. Simply speaking a custodian manages the technical aspects of a security portfolio. The custodian executes trades records and receives interest coupons and dividends on behalf of the investor and sometimes offers “add on services” like reporting accounting cash management securities lending programs etc. Some more background of the custodian business can be found for instance here or for a real deep dive this 100 page + overview of the industry. In general one could asay that the custodian business is an interesting growing business however it is not clear if specialists or universal banks will profit most. Personally I think that after the crisis a specialist with “untarnished” reputation might have a certain reputation advantage. The first part is relatively easy and is depending on the size of the administrated portfolios and the frequency of transactions. The second part is more difficult. Of the ~5 bn EUR financial liabilities around 0.5 bn are deposits from other banks so called “wholesale” funding. 4.5 bn are from non banks. Of the non-bank money again 0.7 bn are time deposits and 3.8 bn are “demand deposits”. The non-bank demand deposit is the interesting part. Although this amount is fluctuating significantly a large part of this is “float”. usually every day some of the securities either pay interest dividend or mature. So KAS bank has a constant cash inflow from its client portfolios. Only few clients manage those cash flows on a day-to-day basis. Normally they only act if a certain amount accrues. Custodian banks sometimes offer interest for those accounts at usually well below market rates. In normal times the custodians than invest those funds into the “normal” money market and earn a nice spread. However at the moment, with short term interest rates at zero this “spread” is almost zero to. So for custodian banks the “float” part of the business is at its worst point in the cycle. KAS Bank (as many others) even took this further in investing part of the float into a security portfolio which at times can produce some mtm changes as we all know. Looking at the pure “net interest result” without derivatives we can clearly see that KAS Bank could generate even in 2008 around 30 mn net interest result whereas in 2011 this amount dropped to 20 mn EUR pre tax. Net commission income at the moment is around ~70 mn EUR this used to be ~90 mn EUR p.a. in the good days. So we can see that both pillars are at the moment at a depressed status. Another interesting aspect is that custodians scale quite well. More transactions do not require a lot of more expenses if the infrastructure is in place. So if business (and interest rates) pick up profits will increase over proportionally. Custodian business in principle is a kind of “commodity” business. However there are some significant switching costs associated with changing custodians especially with more complex institutions like pension funds and insurance companies. Within total costs for managing financial assets custodian fees are a relatively small cost block however in the overall process the custodian is very important. So many institutions will think twice before changing an existing custodian relationship because any cost advantage will not be very big compared to the potential hassle. I would call this a “weak” moat. Non-operating result in Q1 2012 comes to €2.0 million and is chiefly attributable to the revaluation of a number of perpetual loans from banks. The proceeds of the planned sale of the shareholding in LCH.Clearnet will contribute €4.3 million net to the result in 2012. So this seems to be a realization of a “Hidden asset”. In accordance with the dividend policy discussed with the General Meeting of Shareholders, our target is to distribute 60-80% of the net result, where the profit permits and unless prevented by exceptional circumstances. The following institutions have given notification of holdings of 5% or more in KAS BANK pursuant to the Financial Supervision Act and the Decree on Disclosure of Control and Major Holdings in Listed Companies. Historically ING held more than double the current amount and sold down half of their stake in 2007 and 2008. Some smaller positions are held by funds the only known value investor is Sparinvest with a 0.17% share. However the seem to have a “Poison Pill” in place for unfriendly take overs. So this limits any take over (and short term catalyst) “fantasies to a certain extent. The stock is followed only by a few Dutch analysts 4 of 5 analysts have a buy rating with target prices between 10-13 EUR per share. Management owns smaller positions in the stock and some options but compared to salaries (which ar Ok by the way) stock exposure of management is relatively small. So there would be some room for improvement. For me KAS bank is one of the few financial institutions where I would see a good “reversion to the mean” opportunity. They currently trade at an approximated “normalised” bottom of the cycle P/E of 7 and P/B of 0.6. Average EPS over the last 14 years was 1.74. If we assume that conservatively They can achieve the 1.75 at some point in time in the future and a “fair P/E would be 10 then the share could be worth ~17,50 EUR. Average Price/Book over the last 14 years was about 1.2 so this would imply a double on current P/B of 0.6 if things return to “Normal” for KAS Bank. Discounted by 10% this would again give us a value around double the current market price. So from a valuation point of view I would say that KAS Bank should be worth double before any growth and excluding any future catastrophes. From a momentum point of view one shouldn’t touch the stock. In contrast to most other banks the stock didn’t rebound at all in the past few weeks. This might reflect that KAS Bank has not a lot of PIIGS exposure. Positively one could say that at least based on the last few months the stock price has found a floor at around 7 EUR. Personally I think that KAS Bank now has reached a “fundamental” floor so in this case i will again ignore stock price “momentum” to a certain extent. Although this is not the most important decision point for me, the low correlation of KAS Bank makes it very attractive from a portfolio risk point of view. For the portfolio I will start as usual with a half position (2.5%) and then decide after the half year report if I want to increase. IMPORTANT: Most of those stocks will not be really investments. This is “just for fun” mostly. So if you are looking for “actionable ideas with a catalyst” you might consider skipping this series. If you are however more liek a “stock collector” feel free to read and comment. In the internet there is often a lively debate about the fact that the US Fed is in principle privately owned. I don’t want to touch this now as this pretty quickly goes into the racist or religious direction. So lets look at two other National banks. Not many people know that both the Swiss National Bank (ISIN CH0001319265) and the Belgium National Bank (BE0003008019) are both listed stock companies. The SNB has 100 thsd shares outstanding giving it a market cap of ~100 mn “Swissies”. Not a lot for a bank who can print one of the hardest currencies in the world and is holding 400 bn CHF foreign reserves ? To make things more interesting, the SNB had a profit of 6.5 bn CHF (!!!) in the first 6 month of the year. So ist his a P/E 0.01 investment ? Not so fast there are some details to consider. So effectively we do have a perpetual Swiss Frank Bond with a yield of around ~1.5 % at current prices, which for CHF is not unattractive. For some strange reason a German professor is the largest private shareholder of SNB with almost 5.6% which caused some raised eyebrows in Switzerland. According to the Economist only ~53% are held by Swiss Government entities. Summary: If you are bullish on the Swissie it could be a good hedge to buy SNB shares. additionally it might be just fun to be shareholder of the Swiss Nationalbank. If you have some spare time the annual meeting might be good entertainment. However it clearly does not fit into my portfolio. The Belgium National bank is also a listed company. Interestingly tiny weak Belgium National Bank has a market cap of 900 mn EUR ~8 times that of “Mighty” SNB. How comes ? So clearly the BNB is paying out a lot more than the SNB having a nice yield of around 6.2%. The “Mechanics” of the dividend are published unfortunately only in Dutch or French. 2. Additionally the National Bank reserves a part of the profit which prevents that all profit is distributed to the Government. The yield on this reserve is then distributed to the shareholders. In the latest shareholder presentation there are some slides regarding this reserves and average yields etc. I didn’t fully understand the mechanism but it looks like that BNB shareholders were one of the beneficiaries of expanding central bank balance sheets. Summary: Although i don’t fully understand the mechanism the BNB profit distribution mechanism looks quite interesting. I am not sure if this is an investment right now but something to keep on the radar screen maybe as an alternative to long term bonds with in implicit Financial crisis option. The stock actually would qualify for the “Exotic security” category as well. After the dramatic increase in the Draeger Genußscheine, the portfolio weight of this position increased to aropund 11%. As 10% is my maximum treshold, I will sell down to 10% of portfolio weight from today on. Manchester United is now avaliable to short at Interactive Brokers. Therefore I will start with a 1% portfolio weight short position as of today as discussed in the post. On the third trading day, the stock showed already a similar pattern to Facebook after the IPO, with the banks supportiung now at 13,40 USD after the IPO price didn’t hold. For those 3 companies, I will add to a full 5% over the next days depending on volume. By the way, please do not forget that I might own or buy or sell the mentioned securities privatley and read the disclaimer.